Get ready to hit the slopes! If you are counting down the days and weeks to your skiing holiday, you might be thinking about how best to prepare your body to get the most out of your trip. The team at Keith James Physiotherapy can help you to get ready to hit the slopes. 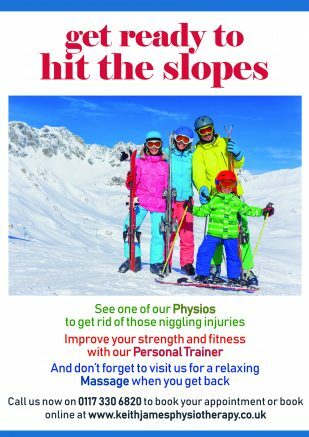 As well as treating the injuries that happen during the ski trip, physiotherapists are really good at preparing you for your holiday. They can help you with niggling back issues, which can get worse on hard-packed snow. And when the snow is deep, catching your skis in the snow can cause knee ligament issues to be exacerbated. Why not make an appointment to see one of our physios and sort out any pain or stiffness before you head off. Physiotherapists find that preparing for a ski holiday by investing in fitness, strength and endurance training can help you to avoid succumbing to common skiing injuries. Why not book a series of Personal Training sessions with our Personal Trainer, Kirstie. She can help you develop the flexibility, power and balance that will allow to you move well on the snow. And when you return from your skiing trip, don’t forget to book yourself in for a relaxing massage to help with the aches and bruises you picked up along the way. Call us on (0117) 330 6820 to book or book online at www.keithjamesphysiotherapy.co.uk.